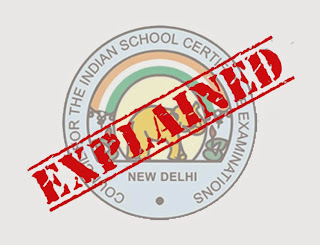 The CISCE Council had been constituted to represent: Government of India, State Governments/Union Territories, in which there are schools affiliated to the council, the Inter-State Board for Anglo-Indian Education, the Association of Indian Universities, the Association of Heads of Anglo-Indian Schools, the Indian Public Schools' Conference, the Associations of Schools for the ISC Examinations and members co-opted by the Executive Committee of the Council. The fact that most people think ICSE is a Board, it is actually an examination! The Indian Certificate of Secondary Education (ICSE) has been designed to provide an examination in a course of general education, in accordance with the recommendations of the New Education Policy 1986, through the medium of English. Private candidates are not permitted to appear for this examination. The Certificate of Vocational Education Examination (CVE - 12) has been created as an examination, in accordance with the recommendations of the Ministry of Human Resource Development (MHRD) through the Joint Council of Vocational Education (JCVE) established under the National Policy of Education 1986. This examination can be taken by candidates after a two year course of studies beyond the Indian Certificate of Secondary Education (Year 10) examination or its equivalent examination, through the medium of English. The C.V.E. course is intended to prepare candidates for specific vocations. Private candidates are not permitted to appear for these examinations. • Subjects Offered ICSE in 2013-64 with 23 Indian languages and 12 are foreign languages. • Subjects Offered ISC in 2013- 50 with 23 Indian languages and 12 are foreign languages. 1. Course curriculum is wide, covering a range of topics to explore overall growth of students. 2. CISCE prefers to give more practical Knowledge and focus more on analytical skills. 3. Subject selection options available to students to follow their liking for a particular subject. 4. The CISCE board has equal focus on languages, science and art and encourages students to choose across diverse topics / subjects for their Class-12 exam. 1. Students may find syllabus a bit cumbersome. 4. Although Major Entrance Exams syllabus is based on CISCE, the fact that the seats for those courses are open for all students in India. And colleges which are coming under state universities have more reserved seats for students from state boards. So students from CISCE board who wouldn’t crack entrance exams face problems in getting admission in state university colleges as they have very less number of seats for CISCE Board. 5. Students may find the syllabus to be too extensive for their liking, as an average student practicing under an ICSE board will face thirteen subjects/examinations during the sixth grade, when compared to the six subjects faced by the student’s counterpart in a CBSE affiliated school.